Need some heavy-duty-choppy backup? Then summon the Retributors! Caveats apply. 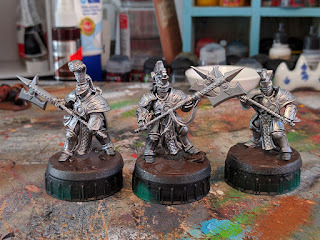 It's been a long time since I posted my first unit of Stormtonnians. I actually managed to paint these Retributors towards the end of last year, but the house move got in the way of shooting and posting them. There isn't much to say about these chaps technique-wise. 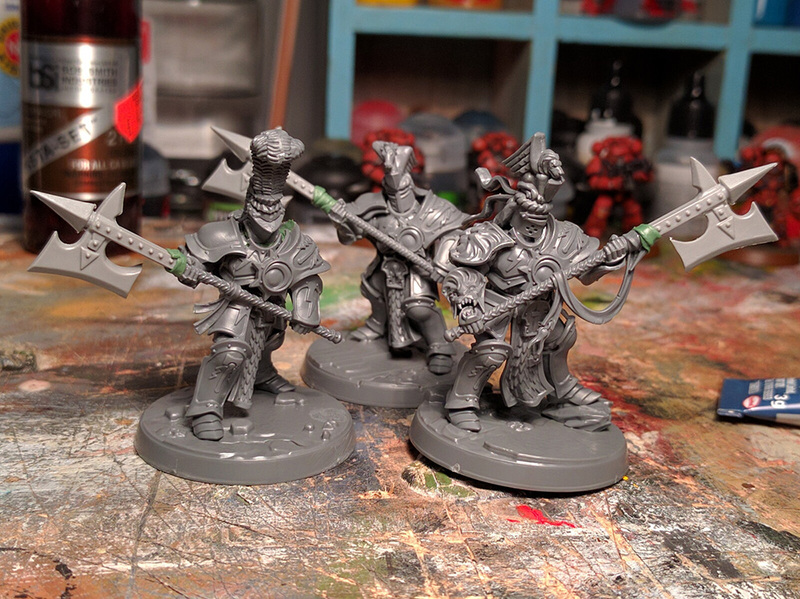 They pretty much adhere to the same paint recipe as the first unit. The axe heads are from the older Chaos kits and there were a... challenge to attach. The cloth wound around the shafts hides the rather awkward join. I chose more ostentatious 'hats' for this lot, as befits their status as definitely-not-arrogant elites. Each carries a small kite shield on his back (in place of the normal 'backpack'). The heraldry matches throughout each individual. I've got better at taking WIP shots so here are a few. I find sharing stuff with friends on WhatsApp is a good way keep motivated and get feedback. Fun fact! The little white porcelain 'mountain' behind the guys in the lower shot is a chopstick holder. They make excellent brush rests when you're painting and ensure you don't accidentally roll your brushes around and ruin the bristles in so doing. You idiot. So, what are the caveats? Well, turns out 'teleporting' these guys into a Skirmish game isn't ideal. Such games rely on speed and decisiveness. 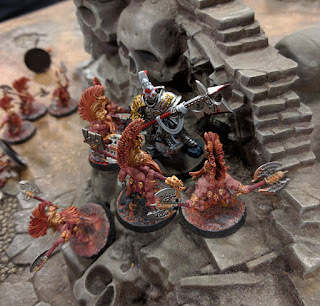 Once they have deployed, the Retributors have to plod over to the enemy (say, some angry Fyreslayers) while the combustible little fellows repeatedly smack your outnumbered Liberators until they die. Cue the orange menace ganging up on the Johnny-come-lately Retributors. Regardless, it was fun to get all the shiny guys together on the table at once. Here they are, full of beans, before it dawns on them that they're about to get their behinds whipped by some small, angry, naked guys. The next step for this collection is to convert Steelheart's Champions so I can bring the glory of The Lady to Shadespire. The kits are beautiful and their configuration will mean the head swaps will be easy. Great additions, I'm going to try to concept with the Sacrosanct Chamber. Their robes and tabards have a medieval templar look. Substantial improvement on the usual Stormcast. Also, great use of those comically over-sized ax heads. Those really do look amazing. The head swap does so much to change the overall feel of the Models. I look forward to seeing what you do with Steelheart's Champions. There are so many great directions those Models can be taken in. These look great, but I think the little green thing on the back of the helm of the stormtonian in the bottom left is actually meant to be a chain to hang the helmet from the body of an unhelmeted knight errant.